Projection mapping is the cutting edge of modern art, technology, and design, and I take genuine pride in being a part of this medium. Chicago-based 3D projection media company Chicago Projection Mapping (CPM) announced today the inclusion of Chicago Projection Mapping's J Matthew Nix in an upcoming Chicago visual artist profile series, directed by acclaimed Chicago photojournalist Jim Vondruska. The series, which features multidisciplinary artists from throughout the Chicagoland area, will showcase both Matthew and CPM’s work at “The Sun at Somerset”, a permanent projection installation in the Uptown neighborhood of Chicago. Since 2012, J Matthew Nix has been a key player in establishing CPM’s reputation as a national leader in the field of 3D and 4D projection mapping. Since discovering projection mapping in 2010, Matthew became one of the first American creatives to fully adopt mapping as his primary medium. 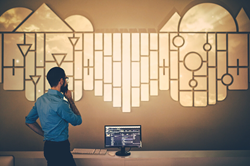 Beyond the extensive technical and creative knowledge to create a mapping display, Matthew has a personal passion for elevating projection mapping beyond conventional interpretations of the medium. Matthew is also lead designer for CPM Labs, Chicago Projection Mapping’s research and development division. In addition to leading development on the custom-designed CPM Pro Server mapping system, Matthew coordinates and creates custom interface and controllers for CPM clients, ranging from corporate activations to avant-garde artistic displays. Matthew is also a professional educator, offering direct consultations and learning sessions for companies and organization, including past sessions for Soho House, IDEO, and theWit Hotel, among others. The full artist series is slated for release in Summer 2016. Contact Chicago Projection Mapping today for further inquiries, or to bring projection mapping to your next activation, kiosk, trade show display, or interactive application. About Chicago Projection Mapping: Based in Chicago, IL, Chicago Projection Mapping is a full service content creation and 3D projection mapping company, serving the corporate, event, meeting, and convention sectors. For more information, please visit http://www.ChicagoProjectionMapping.com, or call 630-620-0000.